7-Eleven, that bastion of finely textured burgers and sweetastic Slurpees, will soon dot the isle of Manhattan like popcorn bits on movie theater seats: in the next five years, 114 of the suckers will be opening. No doubt some will applaud this proliferation, but I weep for the ubiquitous crusty bodega. Like peepshows and subway art before them, bodegas stand in serious danger of becoming safe for visiting relatives. In that dystopian future, you’ll have to shower before rolling into the corner deli on weekday mornings, hungover, your body panging for an egg-and-cheese and sock-juice coffee. 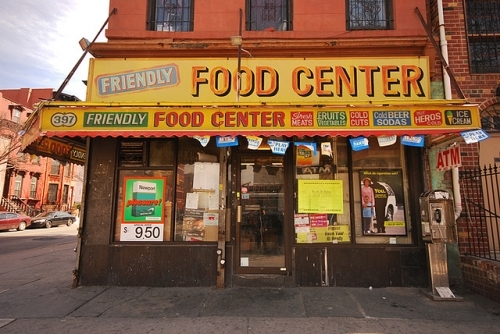 So, fellow wallowers, let us now praise dingy bodegas. As is proper to nostalgia, we’ll do so with a string of anecdotes only tangentially related to bodegas and their signage trumpeting (nonexistent) stores of “organic” and “natural” foods, as well as cold beer and ATMs. A few years back, I was moving into a new place in the nosebleed section of Manhattan, north of half the Bronx. While new roomie and I were schlepping boxes into the lobby, the sweetest orange tabby I’ve ever seen got himself caught in the vestibule. He mewed so incessantly I caved and let him in. As soon as I’d opened the door, he was climbing me like a tree. “Hey fucker, get off me!” I yelped, thinking fleas and other crawling nasties. I discovered that he belonged to the bodega next door, so I tried to take him back. “Here’s your cat.” “Not my cat.” “Hey man, c’mon, just take your cat. People know he’s yours.” “Not my cat.” So we took him to a cat lady, and I took my business to another bodega. Not only did it have a cat to keep rodents away; the owner wasn’t a prick. All those times we needed a loosie, you shady bodegas were there for us in a way that tobacco shops rarely are. Even if it was a Newport. A guy at this Midtown deli was so goddamn good that he knew what his many weekday regulars wanted and would have it ready for them in the time it took them to approach the counter. Within a week, he'd memorized my $1.75 “special”: butter on a toasted roll plus coffee like a hot milkshake. Or that hypothetical time you needed condoms, like stat, and it was after ten and the pharmacy was closed. 7-Eleven probably carries mainstream brands like Trojan and Durex, but the bodega at the end of your street? It’s going to broaden your horizons. When else is necessity going to be so compelling that you purchase (and use) Rough Riders? You bodegas are somewhat more salty than sweet, it’s true. But those of us who savor life’s tangier bits will mourn you the way others mourn New York’s pickle vendors.